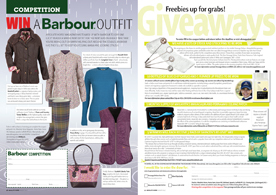 Barbour: Debbie Fisher, Kent. Blue Chip: Angela Saych, Essex; Camilla Bedford, Derbyshire; Freda Withington, Staffordshire; Jackie Pinner, Essex; Kimberly Ballard, Essex; Lynda Pither, Norfolk; Mary Cawston, Suffolk; Nicola Cartwright, Norfolk; Tina Jones, Ceredigian; Tracey Stevens, Norfolk. (runners up:) Alexis Smith, Suffolk; Gill Mills, Essex; Jamie Bentley, Essex; Rachel Chisnell, Essex; Sameena Rush, Essex. Dressage Deluxe: Catherine Barrett, Norfolk; Chloe Fulcher, Suffolk; Georgina Green, Essex; Joanne King, Suffolk. Maxavita: Fiona Charnley, Norfolk; Joanne Harrison, Cambridge; Maddy James, Essex. Saracen: Anne May, Suffolk; Harriet Haste, Suffolk; Karen Bracebridge, Herts; Mrs S Tyrell, Essex; Susan Evans, Essex. 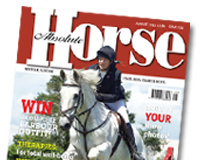 Horse World Live Tickets: Pip Field, Essex; Nicky Charity, Norfolk; Victoria Salisbury, Norfolk.